Paul Tesar, the Dr. Donald and Ruth Weber Goodman Professor of Innovative Therapeutics in the Department of Genetics and Genome Sciences at Case Western Reserve University School of Medicine, has been selected to receive the 2017 New York Stem Cell Foundation-Robertson Stem Cell Prize. Tesar’s scientific effort leverages cutting-edge stem cell technologies to develop new therapeutics for human nervous system disorders including multiple sclerosis, cerebral palsy and leukodystrophies (rare genetic diseases that affect the brain and spinal cord). Millions of people worldwide suffer from these diseases, for which there are no cure. The award, initiated in 2011 by famed investor Julian Robertson and organized by the New York Stem Cell Foundation, recognizes “the most promising translational research using stem cells” and provides $200,000 in research funds. Last year the prize was awarded to Feng Zhang, of MIT, one of the discoverers of CRISPR genome editing technology. Tesar was recognized for his “pioneering discovery” of pluripotent epiblast stem cells and technologies using pluripotent stem cells to discover new treatments for neurological disorders of myelin such as multiple sclerosis and pediatric leukodystrophies. Pluripotent stem cells give rise to all of the cell types in the body. Over the past 10 years, Tesar and his team have contributed groundbreaking discoveries spanning fundamental aspects of stem cell biology all the way to the development of new stem cell-based therapeutics for clinical application. In a landmark paper in 2007, Tesar and colleagues showed that a new type of pluripotent cell could be isolated and propagated in the laboratory. The discovery of these epiblast stem cells changed the understanding of early mammalian development and directly enabled the creation of many functional cell types for study and clinical application. More recently, Tesar and his team have blazed new trails to leverage the power of stem cell technologies to rapidly and efficiently generate previously inaccessible brain cell types in the lab. In 2011, Tesar’s lab described a rapid and scalable process for generating pure populations of oligodendrocyte progenitor cells (OPCs) from pluripotent stem cells. OPCs are a specialized stem cell population normally found throughout the adult brain and spinal cord. These cells function to generate mature oligodendrocytes, which in turn create the myelin sheath for insulating and protecting neurons—which is damaged in multiple sclerosis and similar disorders. In 2013, Tesar’s team described a separate and equally transformational technology that converts skin cells directly into OPCs. Collectively, Tesar’s cellular technologies overcame a significant hurdle of previous myelin-repair research by providing scalable access to the cell types directly relevant to myelin diseases. Tesar and his team have built on the power of their OPC technologies to develop and validate a new high throughput drug-screening platform to identify the most promising medications to regenerate myelin in patients. In 2015, they published a field-changing report showing that drugs identified with their high throughput screening technology could restore myelin and reverse paralysis in rodent models of multiple sclerosis. Earlier this year, Tesar’s team advanced this same OPC technology to pinpoint the underlying cellular dysfunction in pediatric patients with genetic myelin disorders and test for patient-specific remyelinating medications. Tesar’s New York Stem Cell Foundation-Robertson Stem Cell Prize will be formally presented today at the New York Stem Cell Foundation annual conference in New York City. Tesar, a Cleveland native, earned a BS in biology from Case Western Reserve University and DPhil (PhD) from the University of Oxford as a recipient of the NIH-Oxford Biomedical Research Scholarship. He then transitioned directly into an independent position and started his own laboratory back home in Cleveland at Case Western Reserve School of Medicine in 2010. His previous scientific awards include the International Society for Stem Cell Research Outstanding Young Investigator Award, Harold M. Weintraub Award of the Fred Hutchinson Cancer Research Center, and the Beddington Medal of the British Society for Developmental Biology. Tesar was also a member of the inaugural class of Robertson Investigators of the New York Stem Cell Foundation. 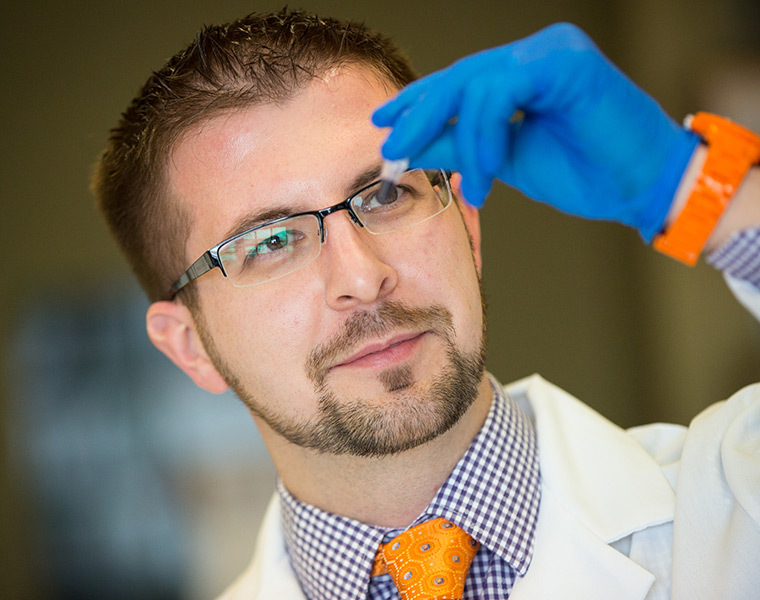 Research in the Tesar laboratory has been supported by funding from the New York Stem Cell Foundation, National Institutes of Health, Mount Sinai Health Care Foundation, Cleveland Foundation, Pelizaeus Merzbacher Disease Foundation, National Multiple Sclerosis Society, Myelin Repair Foundation, Columbus Foundation, Connor B. Judge Foundation, and European Leukodystrophies Association as well as direct philanthropic support from the Goodman, Peterson, Long, Fakhouri, and Geller families.